This site is located at the hockey filed within the Olympic Forest Park, which is further away from other tombstones in the park. The two engraved pillars and one tombstone were established in 1764 for a famous general Zhaohui (1708-1764) in Qing Dynasty, who is also a member of Wuya family belonging to the 9th generation. Zhaohui is famous for his victory of reclaiming the territory with an area of 1.4 million square meters in the northwest China, today’s Xinjiang Uygur Autonomous Region from 1755 to 1760 during emperor Qianlong’s period. Zhaohui was highly respected by emperor Qianlong; when Zhaohui passed away in October of 1764, the emperor designated Zhaohui’s son, Zhalantai as his son in-law, who got married to Princess Heshuo in 1772. 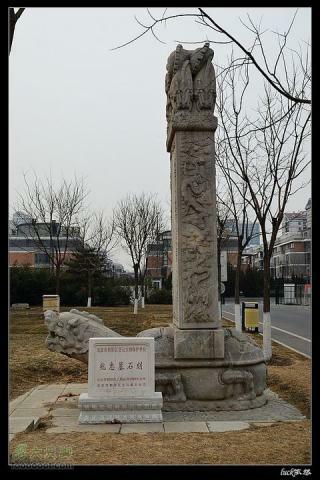 In February 28th 2004, one of the stone statues of “Chongtianhou” (a legendary animal named “roar out towards sky”) that represents auspiciousness decorated on the top of the engraved pillars were stolen and the larcenist/s is/are still not caught yet, which became a pity for the site. Another feature about the site is its connection with the Mansion of Zhaohui in Xicheng district, which is located at Qianjing Hutong in the west part of downtown Beijing (where most of the royal mansions are located).